So I'm back from my first real conference in ten years, and I learned a lot. This is the conference I mentioned a few blog posts back, of the National (US) Coalition for Dialogue and Deliberation. The first thing I learned was: I'm ten years older than I was ten years ago. Conferences have always been exhausting, but this one felt like a strange dream in which crowds of faces surged and receded while I surfed on crests of ... of ... lots of stuff. However, I survived; I have vague memories of the event; and I have some things to tell you. One thing that surprised me at the conference was how many people there do story work. Only a few people said they do story work, but a lot of people worked with stories in some way, while they were trying to get people to understand each other. My initial reaction on pointing this out to myself was, "Sure, but they don't really do story work. It's not as intense or authoritative or authentic or deep or...." And in the midst of trying to justify myself to myself, I realized that I may be on my way to becoming pompous. Do you remember the thing I'm always saying about how the best storytellers are the people who don't realize they are telling stories? About how, once people begin to be proud of the quality of their storytelling, the quality of their storytelling declines? I'm starting to wonder if there is a parallel process in doing story work. Maybe the best story workers are people who work with stories without knowing it. Maybe, over the years, I have become not only a story performer but a story-work performer as well. I'd like to think I have passed through the story-work-performer state into a state of deep wisdom, where I have become both natural and skilled; but, alas, I find that my skills of denial cannot rise to the challenge of this assertion. Solutions to pomposity and story-work performing I can come up with include the following. I could stop doing this work for a while - six months or longer - and see if the pomposity goes away. However, this is not an option, because I still have many promises to keep. I could keep reminding myself that I am not the owner of anything (except my good name) and that many people have had great ideas about story work. But I've been doing that all along, and it doesn't seem to have saved me. No, humility alone is not enough. I need to take positive action. I am always encouraging people to share stories. So why don't I encourage myself to share story work? If I can make a conscious effort to recognize, respect, and connect with the story work other people are doing - even if they don't call it that, or maybe especially if they don't call it that - I can regulate myself to open my mind to all forms of story work. I've done some of this in the past, but honestly, I've done far less than I could have done. Number three is my new plan. One part of the plan is the "translation dictionary" idea, which I think I mentioned here before. This idea is to develop a set of (relatively brief, don't worry) writings about how PNI connects to as many fields and approaches and methods as I can possibly find. Before I went to the NCDD conference, I thought I should build a translation dictionary because it would be helpful to you. Now I think I need it even more than you do. I am sorry to tell you that the "story work means telling stories" assumption is still going strong. People are still very little aware of natural, everyday story sharing and the functions it provides in society and in communities and organizations. When people talked to me about ideas for using stories in their work, their first impulse was always to talk about how they might use stories to communicate with the public -- i.e., to tell stories. I don't ever want to minimize the function of storytelling as purposeful communication. It is reasonable and laudable to convey essential messages through stories. However, if this is the only thing people think they can do with stories, or get from stories, that's a sad thing. Because using stories to communicate is just the tip of the iceberg of what stories can do for a community or organization (or society). Those of us who care about stories have more work to do to get that word out. In More Work with Stories, I connect PNI with nine other fields. But I have been realizing lately that I could probably connect it with ninety, if I broadened the scope to methods and approaches as well. Getting involved with the NCDD has helped me to learn that I have been hiding in a hole in terms of the many ways people have developed to help people make sense of things together. Just because a method doesn't say anything about stories doesn't mean it doesn't have anything to do with stories. If it has to do with people and communication, it has something to do with stories. For example, as part of my NCDD learning, I recently bought The Change Handbook, which describes 61 methods for helping people create positive change. Can you guess how many of those 61 methods I was familiar with before I found the book? Eleven. Why have I not been building more connections? (Because I've been writing a book, that's why; but still.) Now I want to know: How does PNI connect with the World Café? The Art of Hosting? Dynamic Facilitation? Wisdom Circles? Bohm Dialogue? Open Space? Systems Dynamics? Charrettes? Non-Violent Communication? Future Search? And so on. This universe of connections is yet another reason to build a translation dictionary. I had been thinking about the dictionary as a way for people to understand PNI, and above I described it as a way I could share story work more completely. But a translation dictionary could also help people move back and forth between PNI and a variety of other methods as they build the suites and composites that best fit their contexts and purposes. 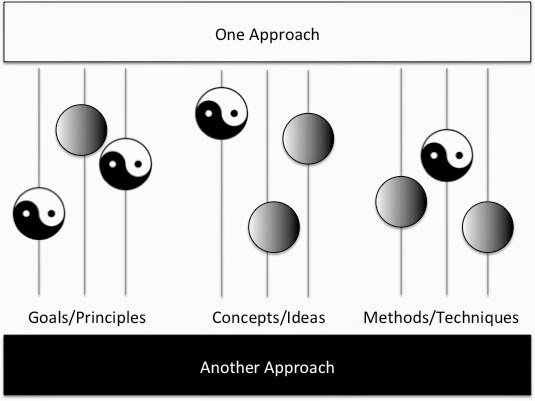 Look for pairings in each of three areas: goals or principles; concepts or ideas; and methods or techniques. Come up with at least one and at most three pairings in each category. For each pairing, decide whether it's a similarity or a contrast. If it's a similarity, describe how the two elements are similar, and how they are (subtly) different. If it's a contrast, describe how the elements differ, and how they are (subtly) similar or at least complementary. For each pairing, describe how it might be used in practice to combine what is best in the two approaches. ...where the grey circles indicate similarities, and the yin/yang symbols represent contrasts. Here I have vertical circle placements showing the relative centrality of each element to each approach, but that might be too fussy. I like diagrams, but I know some people would not get much out of the extra visual information. So as I thought about this template, I realized that I had seen something similar before. What I was creating looked a little like a template for a pattern language. You could even say that my categories of goals, concepts, and methods are like the pattern language elements of context, problem, and solution. Here's a question for you: Everybody loves pattern languages, and rightly so, but why do we have to stop there? Could there be more kinds of languages than just of patterns? What about connection languages that, instead of describing patterns, describe connections? Might pattern languages, which are typically used within approaches (or transcending approaches), contribute to a lack of sharing among approaches? Maybe pattern languages could connect to connection languages, so that you could follow links from inside a particular approach, through its connection language, and into the pattern languages of other approaches. What if lots of people made connection languages? What if, someday, it would be considered uncool to talk about one's approach without also showing one's connection language? What if connection languages were printed on cards, and people could use them to brainstorm about ways they could combine different approaches and methods to get results for their communities and organizations? What if, instead of going shopping for isolated approaches, groups could find the best combinations of methods and ideas for their contexts and purposes? These are just wild speculations, and some might not agree with them. My plan right now is to make a start on my own connection language, using a template like the one above (which will evolve), and fold it into the second book. If you are interested in the idea of connection languages and want to work with me, or do something similar, let me know. Ending up in what seemed to be the wrong place at the wrong time was a revelation. Even though I might never have chosen this conference without someone else planning to go there first, it was just the right conference for me to go to. I have long complained about how there are no good story-listening conferences to go to, how people who do the work I do have to show up as beggars at knowledge management and decision support and management conferences. But I've now come to realize that this poverty is a strength in disguise. I would have learned so much less at a conference where everyone already knew what I had to say, and where I already knew what everyone else had to say. It is so very mind-expanding to go to a conference you feel like you have no reason to go to! In fact, I am now resolved to seek out conferences that have as little as possible in common with what I have done before. If I will not be hopelessly lost and over my head, I should not go. If you know of a conference I should not go to, please let me know about it! What excited me most about this conference was that I was able to connect with people who shared my passion for helping people get along and create better futures together. I sometimes feel alone in what I do, like nobody cares if we stop telling each other stories, like people are content to see stories used only to manipulate and influence. Our nascent PNI Institute is building a new community in the story space, so that's changing already. But the people I met at the NCDD conference really cared about participatory democracy; about inclusion; about bringing power to the people; about bridging divides; about finding better ways forward. They didn't consciously work with stories for the most part, but they cared about the things I cared about. Is this my tribe? I'm not a one-tribe person; I like to flit among several tribes. But this might be one of them. I have placed my full conference notes here for those who would like to read about what went on (that I saw) at the conference. Where do you find the public voice? It's not a trained voice. We hear it every day in every place. In waiting rooms, in bars, around water coolers, in lines at the grocery stores. It is all around us. So why is it unavailable? Because we don't recognize it for what it is. It is too ordinary. There is no them once you know them. It's healing for people to experience people with other beliefs just listening to them. Polarization is the antidote to American ingenuity. Deliberation by itself is not nearly enough when big systems have strong tendencies, and when a merciless climate clock keeps ticking. It is not just an absence of public voice, but strong structural problems. There needs to be an ongoing critical conversation about what our world needs. We need real human experiences, and a non-judgmental, non-politicized space to describe experiences. Instead of coming to agreement, we can take the need to agree away and simply try to understand each other. If you do that, it is easier to understand, and you get to deeper issues. We need to listen to each other in an open-hearted way. We need to have collaborative solutions that have the possibility of going to the next level of facing big issues. We learn from breaking things, making mistakes, trying to do things when we don't know how. A game is like that: a challenge you need to approach via play. People know how to play games. If we want to make it accessible, we have to draw on things they know. Drawing on inherent forms of communication and action works. Giving people a voice ensures that justice and peace aren't just about fighting each other. It's the fact that people can work out their issues on their own. Justice will come about because of a common sense of peace. We have the world's greatest renewable resource: creativity. Hooray for creativity! And for collaboration. Well, folks, I've gone and got myself mixed up in another crazy scheme to save the world. 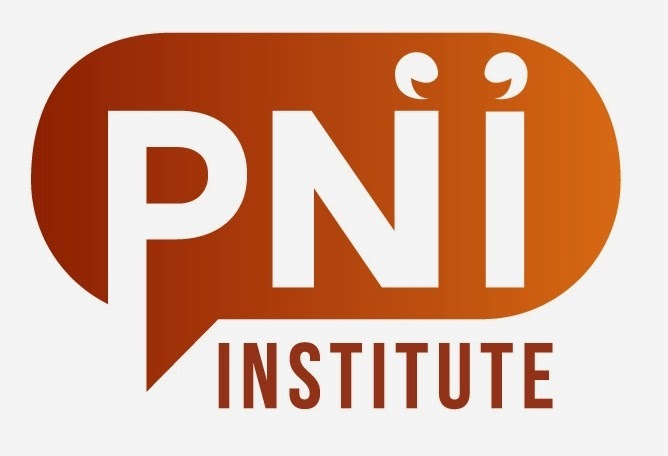 The PNI Institute is a new membership organization for people who are enthusiastic about growing and improving participatory narrative inquiry. It has been created as a collaborative effort by Aiden Choles, Ron Donaldson, Harold van Garderen, and myself. we want to keep doing PNI, so we will collaborate on getting funding for PNI projects. You can read more about these founding ideals on our about page. We plan to expand our membership, though exactly how we go about doing that is still in discussion. An online forum, a collaborative wiki, an online peer-reviewed journal, and some sort of unconference are all being discussed as well. Expect to see more details on the pni2.org web site as time goes by. If you have any ideas about what sort of organization you would like to see grow around PNI, or if you want to get involved in the PNI Institute, please let me know, either in the comments or in email. I'm all ears. One more thing: I will be in Washington, D.C. from the evening of October 15 to the morning of October 20, to attend the NCDD conference. If you live nearby and would like to meet me in person, send me an email and we'll see if we can connect.